Ah, bread. For me, it needs to be crusty on the outside and warm and chewy on the inside. But, other than using my bread maker, I haven't ventured too far into the art of bread making. I've always been intimidated by the work and time involved. So, I was thrilled when I found the book Artisan Bread In Five Minutes A Day, by Jeff Hertzberg and Zoe Francois. Their techniques revolutionize the art of bread making. With a little prep work at the beginning of a week, you can have fresh artisan quality bread every day in just a 5 minutes (not including baking time). Seems too good to be true, no? I bought the book and gave it a try. 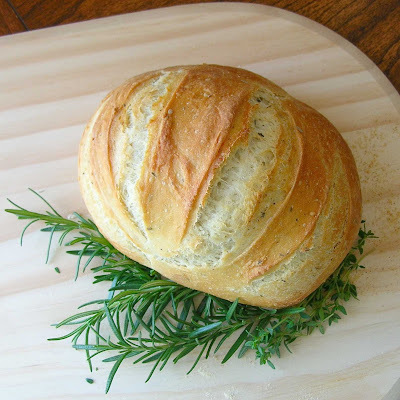 I made the master recipe dough with a mix of herbs on Saturday night before I went to bed. I baked my first loaf on Sunday afternoon. According to the book, the longer the dough sits, the more flavourful it will become. I can't wait to try another loaf. I think the first loaf turned out pretty well. What do you think? The bread turned out really fantastic! It looks better than the so-called artisan breads available in groceries. Great job! Now that looks like pure culinary perfection. My mouth is watering. beautiful bread! Is the dough that white in reality too? That is a positively gorgeous loaf! Thank you so much for trying the bread and sharing it with all of your readers. 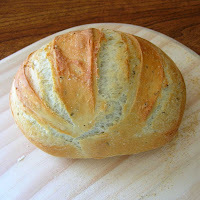 Please check out all of our ideas for the bread that didn't make it in the book at www.artisanbreadinfive.com. There is also an errata sheet that you will want to print out, which can also be found at www.zoebakes.com. js: Thanks. I made the second loaf today and it's even better! zita: Thanks. The herbs are subtle and give it a wonderful flavour. vanielje: Thanks. It made my mouth water also! ilva: Thanks. Yes the dough is that white! I'm Jeff Hertzberg, one of the co-authors of Artisan Bread in Five Minutes a Day. I'm so glad our recipes are working well for you. Come visit us anytime at http://www.artisanbreadinfive.com, where you can post questions into any "Comments" field, or into the "Bread Questions" gateway on the left side of the homepage. That is just beautiful, I absolutely loved it! Gorgeous! Your bread looks great! The rust looks perfectly golden brown. It's a really good bread baking book. The scoring and crust looks great on your bread. Jeff: Thanks for writing such a helpful book! Hungry Hippo: Tease, eh? I used Rosemary, Oregano and Thyme. Kevin: The crust was the perfect. An exceptional boule! Pass the butter, please. That looks absolutely amazing. I clearly need to own the book. My jaw just dropped. This is absolutely perfect! Oh my word!!! As a confirmed bread baking phobic, I am utterly impressed with this. Looks too delicious. Maybe this book is my Holy Grail! This is just the best bread I have ever laid my eyes on...next on my list! BTW, love the name Dragon!! My fave Chinese symbol; has been for years.Am so glad you stopped by my blog!! Muchas gracias!! Me again...can't get the loaf out of my head.Would you be able to send me the recipe whenever you have the time. The book is not available in Inda, *sigh*. I'm already thinking what I have to make over the weekend! YUM!! susan: Butter on it's way. dolores: You won't regret it. jeanne: You must try it. I bet your creations will be amazing. I have just found my weekend project. I'm off to check the website now.